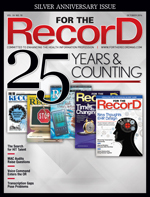 A few things have changed since October 1989 when I wrote “Perspectives on Documentation and Recordkeeping,” the cover story in For The Record’s premier issue. My hair has turned much “blonder,” no doubt due in large part to the more than 100 lengthy major medical malpractice jury trials I’ve been a part of since then. Many of those (OK, they’re white) hairs are directly attributable to dealing with medical records, the critical piece of evidence in these cases. Back then, medical records were largely handwritten. The only components that could be called electronic (as in electric typewriter) were the laboratory and other typed reports. There were preprinted forms to make sure the physician performing the history and physical did not forget to document some aspect of the examination. Normal findings were preprinted and circled (eg, COR-RRR) to make it quicker to document a heart with regular rate and rhythm. Abnormal findings, such as a murmur, rub, or gallop, were notated manually. In 1989, the refined diagnosis-related group (DRG) system, which focused on severity of illness, was introduced. Shortly thereafter “DRG creep,” a phenomenon that led to sicker diagnoses, emerged to arguably maximize reimbursement. Ever since, coding has become high art. Over the years, there have been major shifts—both good and bad—in documentation and recordkeeping practices. From a medical malpractice defense attorney’s perspective, these changes have presented several challenges. Is That Positive or Negative? Today, illegible handwriting is less of a problem. Still, I estimate more than one-half of my cases where care was rendered two to five years earlier involve a fair amount of handwriting. For example, in 2012 I tried a case in which an emergency department nursing note had to be magnified to determine whether a dot was a period or a comma, a point that turned the case in our favor. There was another case in which a handwriting analyst was required to interpret a number in a patient’s weight, with the crucial issue being when did the patient suffer his significant weight loss. Despite obtaining a subpoena requesting “your entire medical record,” law firms always have dealt with the proclivity of medical office practices to send only the records generated by their practice, ignoring the information they have received from other practitioners. This makes it impossible to determine what information was or wasn’t available to inform the practitioner’s decision making. Now that many practices are being purchased or absorbed by the clinical arm of large health care systems, more office records are electronic. Records from outside of the practice may be scanned into the EMR or exist only in a physical chart. If scanned, it’s easier to include them in the record production. Unfortunately, it’s rare that the initial response to a records request is complete. This is particularly troublesome when the request is made of our own client. As a result, a paralegal is dispatched to the client’s office to meet with the “record custodian” (usually an office manager) to try to secure the necessary information. On occasion, the HIT team needs to be consulted. Because many plaintiff lawyers procrastinate, defense lawyers usually get involved in the case about two years after the patient treatment on the eve of the expiration of the statute of limitations (for adults; children’s cases could be years later). The advent of electronic clinical equipment has resulted in more data being captured, but how long they are saved is highly variable. For example, monitors such as rhythm strips and continuous pulse oximeters produce valuable data. The acquisition may be continuous, but the chart captures only according to the frequency specified. When a new patient is placed on a monitor, the data are overwritten and lost forever. For example, in birth injury cases, the electronic fetal monitoring (EFM) strip can contain handwritten nurse annotations such as “pushing” and “on L side.” While entering information on an EFM according to the required frequency generates more entries, there actually is less new information. Sometimes the continuous maternal pulse oximeter on a laboring mother with an epidural doesn’t print on the paper chart, but is stored electronically. Therefore, lawyers must request that any printout of the EFM tracing from the optical disc includes all available data. I recently worked with a risk manager who was not aware of this situation. Consequently, the IT department instructed her on how to access the appropriate menus and make the proper selections, resulting in the ability to print color PDF files. In another case, the monitor was not set to enter the pulse oximeter data into the optical record and the paper chart—which may or may not have contained it—was destroyed pursuant to the retention policy. As a result, the data were lost forever. The common practice of opening a progress note, making an entry, and “pending” it without “filing” it until later can raise questions about when an entry was made and cast doubt on its credibility. Was it before or after the cardiac arrest that occurred prior to the end-of-shift charting? If the note was not filed until after the event, it may require an audit trail to determine when and how many times the note was accessed and edited. In a recent death case, the hospital records department actually gave the family’s attorney—before the suit and without my knowledge—a “redlined” copy of the record. Strikeouts and underlining indicated how the record was changed, sometimes several times, with each version becoming more suspect, indicating that the practitioner was simply remembering important information that had been omitted from earlier versions. However, because the note did not have to be completed for 24 hours, it was not considered a late entry and did not have to be so identified. Health systems boasting an integrated medical record make it easier for physicians to share important patient information. However, the technology has limitations and potential pitfalls. For example, an Alabama VA pulmonologist recently was accused of insurance fraud for copying the medical findings of others into his notes. According to the initial 2013 report from the VA’s Office of the Medical Inspector, “If third party payers were billed for any of the pulmonologist’s medical evaluations based on copied and pasted entries into the medical record, this could constitute fraud.” The question is whether the physician made it clear he was incorporating historical information as opposed to trying to use someone else’s physical findings as his own with no exam. I am concerned about initial physical exam findings being repeated automatically in the next progress note, with the expectation that if a particular finding changes, it will be done so manually. The medical record must be clear whether the information is historical or findings from a current exam performed by the note’s author. It cannot be an excuse for not repeating an examination when it is indicated. I have encountered a situation in which a physician opened a note at 6:00 AM to document that a postpartum patient may be discharged. As soon as the note was opened, the most current set of vitals, which indicated a normal blood pressure (BP) reading, was pulled into the note. However, one minute later, a nurse entered a severely hypertensive BP into the record, a fact that would not be reflected in the version opened by the physician. There was no mechanism in the EMR software for a progress note that had been opened but not yet filed to be automatically updated with a more current set of vital signs. The note wasn’t filed until hours later, making it appear as if the physician was unaware of the elevated BP—especially since he was signing off the info to a colleague coming on duty. Of course, the sign-off included nothing about an elevated BP. Fortunately, the physician on the next shift became aware of the patient’s condition, but not because he looked in the electronic record’s vital signs section (no need, he got the report, right?). Rather, good old person-to-person communication alerted the staff. Automation increases efficiency, but it also presents opportunities for lapses in accurate documentation that could result in poor care. Health care professionals must adapt to new technology and be aware of its shortcomings. How the industry accomplishes this in an environment where caregivers are being pushed to their limits amid a never-ending quest for enhanced efficiency and productivity remains to be seen. — Stephen A. Ryan, Esq, is chair of the medical device and pharmaceutical liability practice group and the birth injury litigation practice group for Marshall Dennehey Warner Coleman & Goggin, a regional litigation firm with more than 60 medical malpractice lawyers in 20 offices and six states.